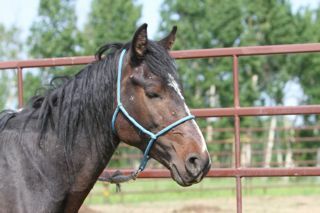 We just wanted to bring you an update on what has happened in one weekend to our two young stallions. This boy was named Rex. 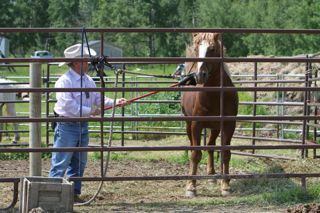 Working as a team, although it was a little bit of a struggle, Dan and Jack introduced him to his first halter. Here he is tied to teach him about what a rope is. Part of the initial training is using a soft bristled broom to touch the new student all over. This lowers the stress on the horse and lessons the chance that one of the handlers could be injured. Rex was quite calm as Jack worked the broom over his face and neck. 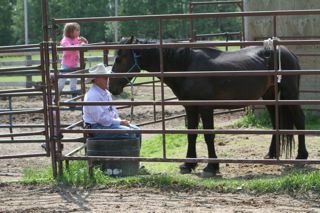 Dan has a bucket of oats with him as he allows Rex to become accustomed to his scent and that he is not a threat. The boy will soon learn of how delicious this treat can be! 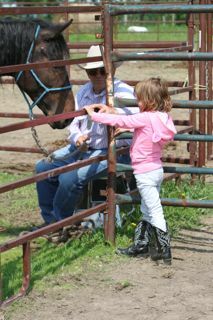 All this aides the horse in learning to trust humans. 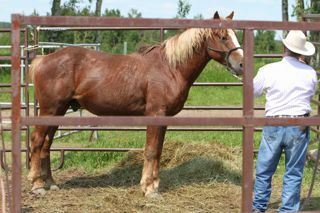 This young boy is named Timber by his new owner. He will however remain with WHOAS as he is gentled further and later gelded. Here he is standing beside Jack with a young visitor looking on. As you can see Timber has progressed extremely well and is not fazed by any of this. 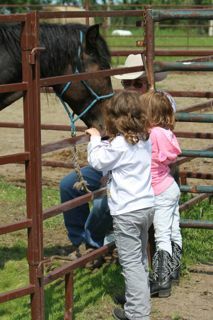 Timber has made two new friends and is quite curious about these little people. Seemingly unafraid he came right up to sniff at their hands much to the delight of both of them and Jack. Unstressed by all that has happened to him in one weekend, and still with lots of people around him, Timber closes his eyes. 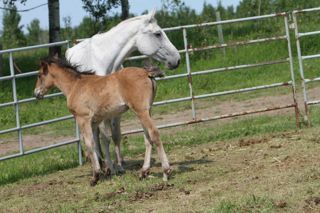 The mare and her filly also gained names this weekend as Mom is called Angel, and her baby is called Sunset. As Jack and Dan need more time with the boys, the gentling of these two will come later. 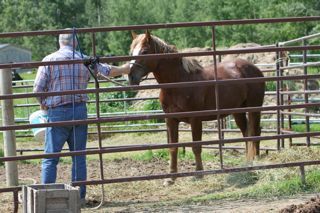 They are both happy in their own pen and the mare is starting to put on some weight. 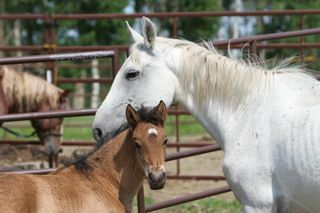 The mare is very protective of her foal.